Valencia is the capital and biggest city of Valencian Community and former Kingdom of Valencia. 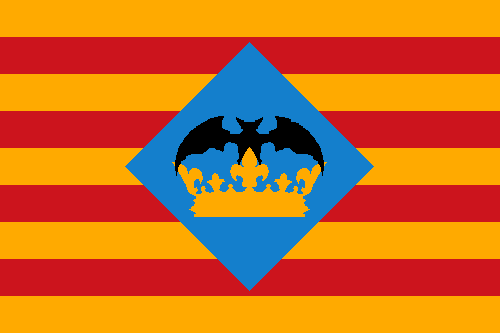 It uses the same, historical flag of Valencian Communtiy, so I thought about a design only for the city. 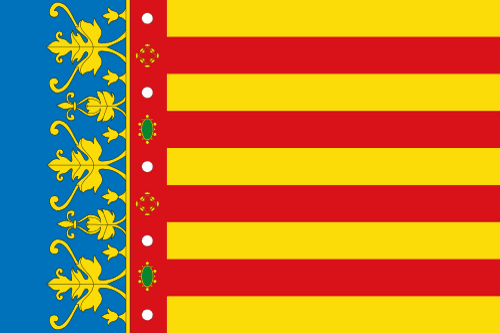 It the senyera of former Crown of Aragon (nine yellow-red horizontal stripes) with a stylized crown, a privilege dating from the second half of 14th century. I'm more inclined towards second scheme, but I think Valencian people would be proud of both. Which one of designs do you prefer? Orlando, Florida is one of main touristic destinations of the world, being known as "Theme Park Capital of the World" for hosting World Disney World Resort, Universal Orlando Resort, SeaWorld, Gatorland and Wet'n'Wild. I kept the white-blue bicolor for being a distinctive background. 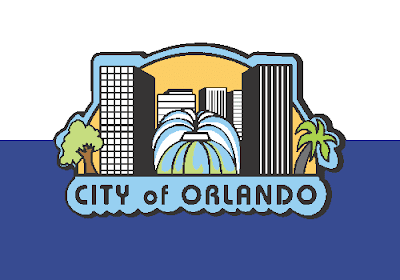 The blue ring forms the letter "O", the initial of "Orlando". Giving the due credit, the fountain drawing was based in a logo by Frank Rodriguez (from MUDSHOCK). I'm sorry for not posting last week, but I hope that this week's inspiration pays off. 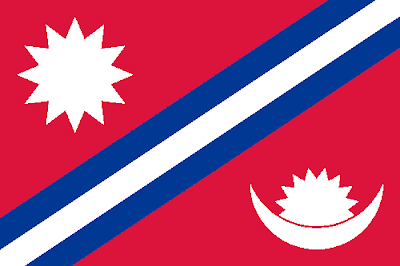 Nepal is the only non-rectangular surviving national flag. Its oddity gathers legions of fans; I'm not one of them. It's an expensive, non-aerodynamic (what makes it inevitably short-lived) flag, and reproducing it in accordance to construction sheet can be a formidable challenge. Proposals of amendment seems to have happened very recently. I think that, since all elements are relevant (including the triangles, that, in popular lore, represent the many and notable mountains of the country), I should keep them. 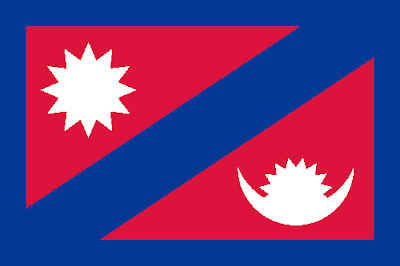 I've used the symmetry of flag elements in my favor, arranging the triangles to form a rectangle. 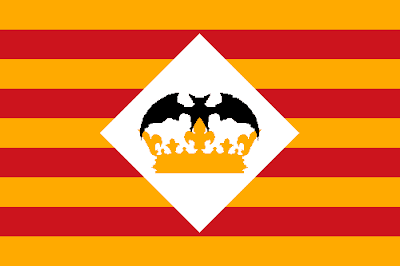 This flag is, from a vexillological point of view, much more effective. For a minor detail, I've added a border outside the crescent moon. 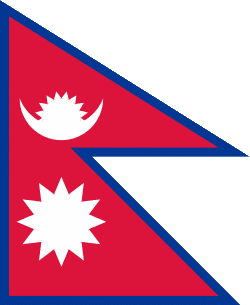 But it didn't shouted "Nepal! 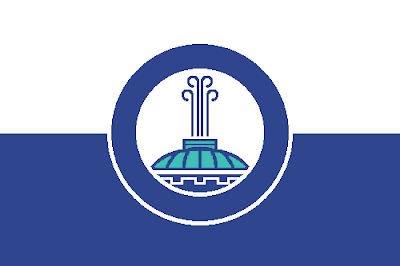 ", so I inverted the blue and white diagonals. This flag may not be as contrasting as the previous, but I think it's more truer to Nepalese history and more similar to current flag. 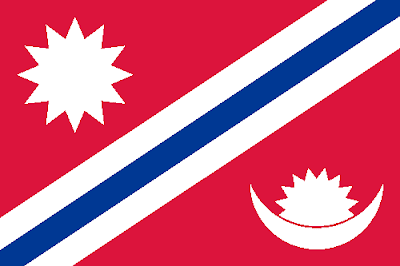 I want to know: Do you like current Nepalese flag?